Solution-Processed Organic Solar Cells for Energy-Efficient Buildings. Organic solar cells potentially can offer low cost, large area, flexible, light-weight, clean, and quiet alternative energy sources for indoor and outdoor applications. In this talk, I will give an overview of the current progress and challenges in solution-processed organic solar cells and their potential applications in energy-efficient buildings. Then, I will discuss recent progress at UCSB on the development of molecular donor and acceptor materials for application in solution processed bulk heterojunction solar cells. Molecular donors offer potential advantages over conjugated polymer systems in terms of their ease of synthesis and purification; making them more affordable to produce on large scales. Additionally, small molecules do not suffer from molecular weight dependence and polydispersity, and thus large batch-to-batch variation as their polymer counterparts. Chemical structure and processing conditions can be used to tune the energy level, bandgap, solubility, molecular packing, film morphology, exciton diffusion, charge mobility, charge recombination, and therefore, the device performance. A combination of techniques is employed to characterize material properties especially nanoscale morphology including steady-state and time-resolved spectroscopy, atomic force microscopy (AFM), photoconductive AFM, TEM, XRD, UPS, and GIWAXS. The results from these studies provide design guidelines for new generation of materials for applications in organic solar cells. 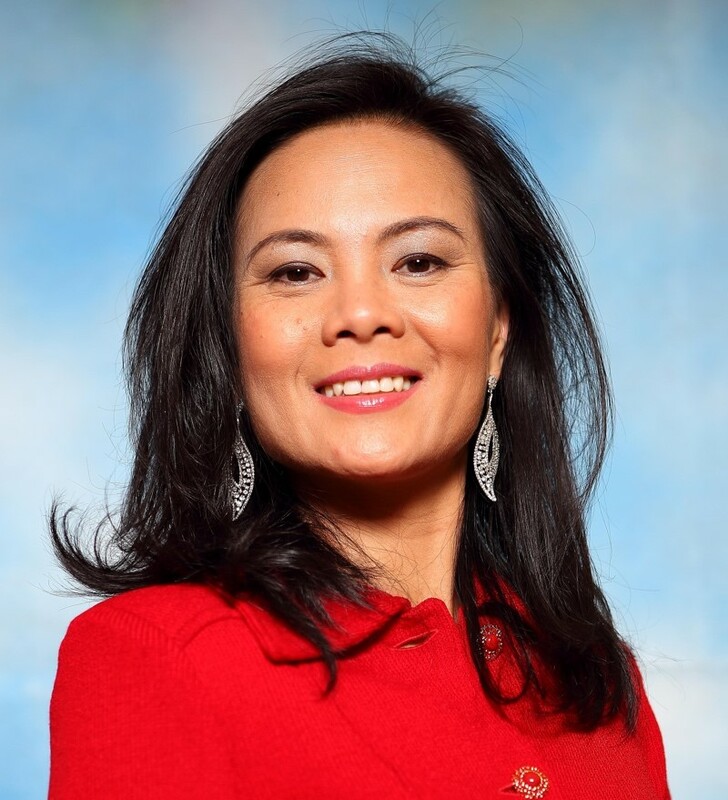 Thuc-Quyen Nguyen is Full Professor in the Center for Polymers and Organic Solids (CPOS) and the Department of Chemistry & Biochemistry at the University of California, Santa Barbara (UCSB). Professor Nguyen received her B.S., M.S., and Ph.D. degrees in Physical Chemistry from the University of California, Los Angeles, in 1997, 1998, and 2001, respectively. Her thesis research focused on processing and photophysics of conducting polymers using ultrafast spectroscopy under the supervision of Professor Benjamin Schwartz. She was a research associate in the Department of Chemistry and the Nanocenter at Columbia University working with Professors Louis Brus and Colin Nuckolls on molecular self-assembly, nanoscale characterization and devices. She also spent time at IBM Research Center at T. J. Watson (Yorktown Heights, NY) working with Richard Martel and Phaedon Avouris on molecular electronics. She joined the faculty of the Chemistry and Biochemistry Department at UCSB in July 2004. She is a Scientific Editor of the Materials Horizons and a member of the Editorial Board of ACS Energy Letters, ChemPlusChem, and Journal of Advanced Materials and Devices. Recognition for her research includes the 2005 Office of Naval Research Young Investigator Award, the 2006 NSF CAREER Award, the 2007 Harold Plous Award, the 2008 Camille Dreyfus Teacher Scholar Award, the 2009 Alfred Sloan Research Fellows, the 2010 National Science Foundation American Competitiveness and Innovation Fellows, the 2015 Alexander von Humboldt Senior Research Award, the 2016 Fellow of the Royal Society of Chemistry, and the 2015, 2016, and 2017 World’s Most Influential Scientific Minds; Top 1% Highly Cited Researchers in Materials Science by Thomson Reuters and Clarivate Analytics. Her current research interests are electronic properties of conjugated polyelectrolytes, doping in organic semiconductors, charge transport in organic semiconductors and biofilms, bioelectronics, and device physics of organic solar cells, ratchets, transistors, and photodetectors.